Freescale Semiconductor, the global leader in radio frequency (RF) power transistors, introduced the industry’s highest power RF power transistors housed in plastic packaging. 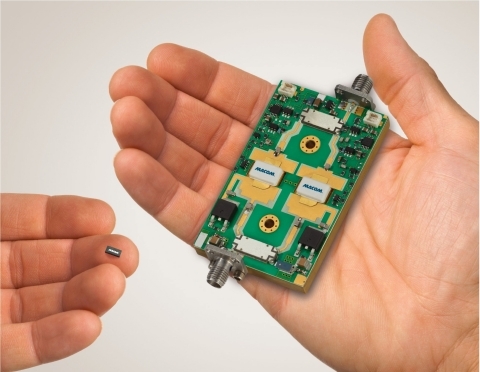 NXP Semiconductors has introduced the first transistors in a 1.1 mm by 1 mm by 0.37 mm low-profile discrete flat no-leads (DFN) package that boost current capabilities up to 3.2 A.
MACOM introduced its series of GaN in Plastic packaged power transistors for high-performance civilian and military radar and communications systems. They scale to peak pulse power levels of 100 W – the highest among competing components in this product category. Premix, the leading specialist in conductive plastics, launches the PREPERM® product family with customizable dielectric properties for high-frequency applications. The new product range provides high-frequency device manufacturers with an outstanding material that maximizes performance without increasing overall costs. PREPERM grades can be cost-effectively injection molded to high frequency antenna parts. Linear Technology announces the LS8 reference family, a series of hermetic precision voltage references packaged in a 5 x 5 mm surface mount, low stress ceramic package. These precision voltage references offer outstanding long term stability and consistent predictable behavior, over time and operating conditions. For instrumentation that demands the best possible performance over years or decades of operation, the LS8 package offers an alternative to large metal can or ceramic DIP packages.